We don't rush into things with our dental treatments at Butterfly Dental in Altrincham. We take the time to get to know you, and your mouth, and give you the very best service. Then again, if you do want to get things over with, we will do all we can to fit into your schedule. 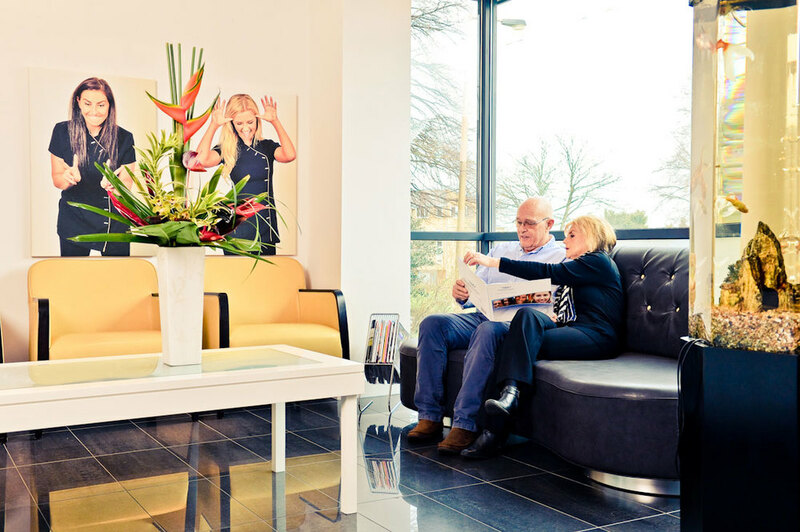 Come on down for a chat, and after our comprehensive initial examination, we'll be able to give you a life story about your mouth, and chat with you about how we think we could give you that great smile you're looking for, in the very best way possible. Of course, there'll be biscuits and a brew too! Plaque & Tartar Buildup - Your first visit will see us give you a detailed examination of your mouth to see where plaque and tartar are collecting. HD Video Camera - We'll film and photograph your mouth, to show you exactly what we're seeing, to give you a better understanding. Microscopic Magnification - Gives us a detailed view of what's going on with your teeth and any previous dental work. Oral Cancer Screening - This standard check up will just make sure everything's healthy in your mouth. General Health Check - We just want to make sure any conditions like diabetes or high blood pressure aren't related to your oral health. Jaw Pains & Problems - We'll analyse any jaw pains or bite related issues, which could cause worn or fractured teeth and headaches. Digital X-Rays - We use our state of the art wireless digital x-rays to get a full examination of your teeth, inside and out, in an instant. Cosmetic Analysis - We'll talk you through the current options available, and how each one might suit your needs. Comprehensive Review - With the check complete, we'll tell you what you need to know, and have a chat about all the different options we could take. Dental Bridges - Bridge the gap between teeth caused by a missing tooth, with a wide range of modern, natural looking teeth, that are as far from 'false' as you can imagine. Dental Implants - Single or multiple implants with the most modern materials available, are a great way to replace any missing teeth in your smile. Root Canals/Endodontics - Let us save and restore any teeth damaged by deep decay and bacteria with a pain free root canal. Dental Crowns - Our porcelain crowns are perfect for cracked or chipped teeth, look amazing, and have 5 year guarantees on them. You can even see what they'll look like with a 3D model before hand. Fillings/Inlays - We'll match our white filling perfectly to the colour of your teeth, so you won't even see it's there, even when you smile. Full Mouth Reconstruction - If you've got a lot of teeth missing or badly damaged, don't worry. Just let us work our magic using a combination of restoration techniques. Teeth Whitening - Completely painless but with maximum results, teeth whitening will quickly and simply transform your teeth. We even have take home kits for you too! Teeth Straightening - We use a modern technology and a super-fast cosmetic brace to help align your teeth to perfection. Veneers - Conceal any teeth you don't like the look of with a beautiful set of porcelain veneers, bonded perfectly and set to last. Bonding - Simple and effective, bonding usually requires just one visit, as we hide small gaps and discolouration with an enamel like material. Contouring - Reshape pointy teeth, redefine flat ones, or just smooth out minor chips from the front, with cosmetic contouring. Dentures - When you think of dentures, do you imagine something your great grandma used to pop out of her mouth and put in a glass on the side of the bed? Our modern dentures fit perfectly, look incredible, and certainly won't be falling out or used for practical jokes! Gum Reshaping - If you feel like your gums cover too much of your teeth, making them appear short and 'gummy', then let us use our state of the art, painless laser technology to reshape your gums into a smile you'll love. CEREC - If you're strapped for time, then this revolutionary Ceramic Reconstruction procedure is perfect for you. We can provide you with the perfect, beautiful crown, veneer or inlay, in just one single visit, with specialist 3D model creation, so you know exactly what you'll be getting, without having to wait. Orthodontics - We're at the forefront of highly trained orthodontics work in Manchester, offering a huge range of options of invisible braces to match your circumstances and needs. Smile Makeover - No matter what state your teeth are in, come sit down with us for a consultation, and we'll show you how we can transform your mouth, so your smile is exactly how you'd love it to be. 6 Month Smile - Straighten, align and perfect your teeth, all in 6 months or less. This procedure is for anyone who needs that self confidence boost and who wants to feel happy when they smile, instead of worrying what other people think. It doesn't take years of wearing braces, and it's completely effective. Free Kids Checkup - Prevention is always the best method for having a perfect smile, and if you're a patient at Butterfly Dental, we invite you to bring your children along for a completely free check up, where we can check the health of their teeth, and make sure they know how to look after them properly!